Alexandra and I are leaving on Friday to go up to Wisconsin to visit Grandma and Grandpa, all the Aunts and Uncles, and Jaelynn for 10 days. I am very excited for the trip. When we get back from Wisconsin about a week and a half later we are going to Greece for 2 weeks to visit Nick's sister. It will be Alexandra's first international travel. We know she will have a blast when we are there; we just hope she adjusts to the time change okay. 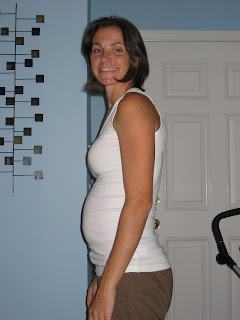 10 1/2 weeks pregnant and my belly has started to expand a little!